Oklahoma Connection | J.C. Penney was the cousin of Anna Korn and, at the time of his induction into the Oklahoma Hall of Fame, owned the largest chain of stores in the world, including 51 stores in Oklahoma. James Cash Penney opened The Golden Rule Store in Wyoming in 1901 on a cash-only basis. Believing this was the key to his long success. Penney stepped down as chairman of the board in 1958, one year after Penney’s began offering credit to its customers. James Cash Penney was born in Missouri and founded his first J.C. Penney store in a tiny mining town in Wyoming in 1902. His first paying job was with a local dry goods firm at a salary of $2.25 per month and his first true business venture was the opening of a short-lived butcher shop in Colorado. He returned to Wyoming and opened his Golden Rule Store on a “cash only basis.” He attributed his success to this policy, and to the profit sharing plan with employees which he developed in 1907. 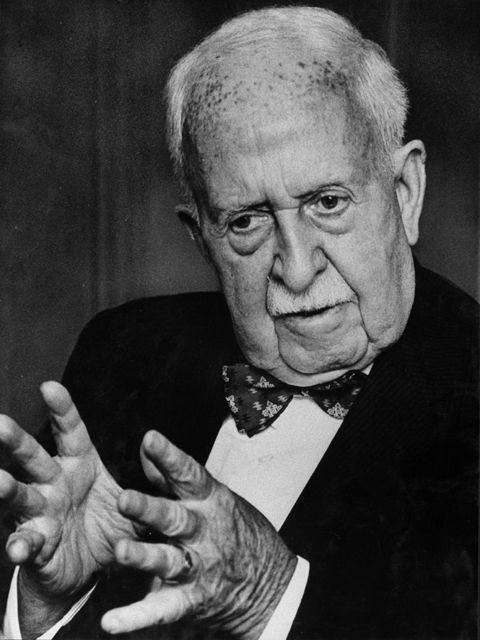 Mr. Penney neither drank nor smoked and built his empire on uncompromising, stiff principles. Mr. Penney called his first biography The Man With a Thousand Partners and wrote other books including Main Street Merchant and A View from the Ninth Decade. See pictures of James Cash Penney and other media HERE.